What exciting news! The Australian Labradoodle as a service and therapy dog will be known to all USA school age children!! The beautifully written and photographed book “Another Language” has been chosen by Pearson Educational Publishers for inclusion in the new Core Curriculum (as part of the new curriculum (K-12) mandated by the Obama Administration to be used in public schools all over the United States!! 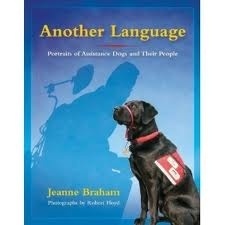 “Another Language”, written by Jeanne Braham (guardian of our Alice) and photographed by Robert Floyd (guardian to our Kiefer and Tasha) AND features a chapter on BERKSHIRE HILLS AUSTRALIAN LABRADOODLES as therapy and service dogs (!!) along with other incredibly inspiring stories will be used to explore with students the therapeutic bonds between dogs and humans, the ways in which life is a collaborative effort, the need to rethink terms like “disabled”, “different,” “handicapped”.